Parents love to see their preschooler exploring the world around them. 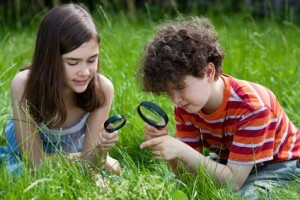 We encourage our children to engage in exploration and play. Rightly so…such exploration helps them discover their interests and strengths during elementary school, their passion and identity during their teen years, and their vocation and independence in young adulthood. Exploring is crucial to healthy developmental in each age group. And, if you really think about it, it requires a great deal of courage for our children to explore the world and “become their own person.” Unfortunately, many parents unwittingly embezzle their children’s innate courage, robbing them of the grit and determination needed to develop healthy independence. Don’t embezzle your children’s innate courage, invest in it and nurture it with these four tips. Accept your children’s unique style of exploration. I have two daughters. One jumps into new activities and experiences. The other wades in slowly, first one toe and then another before her whole foot slips in. Then she slowly (sometimes painfully slowly) wades further in until she is fully immersed. (She takes after me, by the way.) Eventually, both daughters become fully immersed in an adventure, but they required different kinds of support and encouragement. One needed encouragement to “think before she leaps.” The other needed a hand, support, and even a gentle nudge at times. As young adults, they still have different styles and ways of approaching new experiences; but both of them have become independent and capable of courageous exploration. Accepting each child’s unique style of exploration and nurturing it in a complementary manner allows your child to explore courageously. Teach problem-solving. Of course, our children will not have the ability and knowledge to solve every problem that arises. So, when they come to you for help or you see them reach an impasse, teach them problem-solving. Teach problem solving rather than simply solving the problem for them. Ask questions about what they have done and why it did not work. Ask questions to prompt other ways of looking the problem and thus give rise to a potential solution. Help them look at the obstacle from various perspectives and points of view. Come up with three or four possible solutions and let them choose which one they will try first. Learning the process of problem-solving gives children the confidence they need to courageously explore the world around them. These four tips can help increase our children’s courage to explore…and that can help us avoid the “failure to launch” syndrome as they mature. It will also give you the pleasure of watching your child explore the world with confidence and, in so doing, grow more independent and mature. This is such a great article. I feel like a lot of parents don’t think about failure to launch syndrome until their kids are older and experiencing it, and so I think it’s great that you have tips on how to avoid it when your kids are young. You’re a great parent!